The collaboration between IAM, ROI, and the top brokers will see tens of millions of dollars worth of patents offered for sale in technology areas including energy storage, cloud computing, smartphones, wireless communications, OLED displays, and semiconductors. Louis Carbonneau, Founder & CEO of Tangible IP, one of the participating brokers, is also very positive about the initiative: “As one of the top patent brokerage firm worldwide, we always look for opportunities to grow our brand and expand the distribution of our patent listings to new buyers; so we are excited to be included in this collaborative expansion of the IAM Market. The IAM Market showcases our listings and our capabilities for bringing interesting patent purchasing opportunities to the community”. Dynamic IP, ICEBERG IP Group, Tangible IP, and Transactions IP listings will also be available as of today and will be regularly updated as part of the collaboration. IAM Market is an online marketplace that brings together people who see the commercial value of IP and technology and want to do business together. Its online portal allows IP owners to profile their licensing and sales operations and technology transfer programmes, as well as provide details of specific rights that they are interested in transacting. IAM Market is part of IAM (http://www.IAM-Media.com/), the leading content provider that focuses on how intellectual property can be used to create corporate value. Visit www.IAM-Market.com. 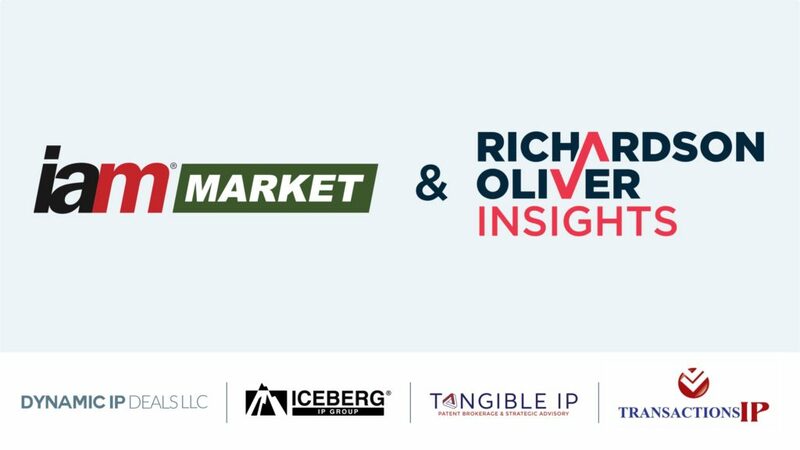 Founded in 2018, Richardson Oliver Insights is a leading provider of secondary patent market data. Led by industry veterans and thought leaders in the heart of Silicon Valley, Richardson Oliver Insights has comprehensive patent market data and analytical experience needed to help patent buyers find the right patents at the right price, help patent sellers optimise their sales offerings, and help patent strategists to make data-driven decisions. Founders Kent Richardson, CEO, and Erik Oliver, Chief Operating Officer, have helped customers navigate the patent market completing more than $115M in patent transactions, and have authored over 80 publications and presentations. Their popular annual patent market report is available here. IAM has selected them to be included in the top 300 IP strategists in the world for the past 10 years running. For more information, visit roipatents.com. Contact Hannes Forssberg Malm, VP Customer Solutions, ROI, at hmalm@roipatents.com if you have any questions. Press release also available on NewsWire.